Some time in the past, something happened, if it happened, that wasn’t good. No one is quite sure what it was, what caused it, and no one talks about it. Because of it, people’s surnames and place names changed so no one could be singled out and no one could be blamed; holding on to memories of the past and family heirlooms is discouraged; love songs and ballads are piped through entertainment systems. And everyone says sorry for everything, every slight or insult. All the saying sorry in the world though doesn’t seem to be able to stop the increased violence being seen everywhere. And it doesn’t seem to make anyone happy. No one in “J” is happy – or at least not happy for long. This includes the two main characters, Kevern Cohen and Ailinn Solomons. Born and raised in Port Reuben, Kevern’s father secretly listened to jazz but put his fingers over his lips whenever he said a word starting with “J”, teaching Kevern to do the same, whilst his mother constantly warned his father to not say anything about anything. Kevern has never felt like he fits in or been accepted by the people of Port Reuben but he’s never sure why. Ailinn, recently arrived from a place “up north” is another outsider, orphaned and adopted by parents who didn’t love her. She feels she is constantly running from something. Then a stranger introduces the unlikely pair and they begin to fall in love. As with all things in this book, however, the course of true love doesn’t run smoothly. Ofnow, the protectors of the public mood, are interested in Kevern, possibly because they have gotten wind he is hording family heirlooms, as are the police, following a murder in town. And, in general, Kevern is a difficult man to love in many ways. He is cautious, reticent, and convinced nothing will end well for him. He might be right because, while I don’t want to give away too much, “J” is not a book with a happy ending. And it’s pretty obvious it wasn’t going to be from the first few chapters. It is, however, a really good – if pessimistic – book. It drew me in straight away and kept me interested until the last page. I liked the style of writing, which is full of dark humour, and the story made me stop and think more than once. 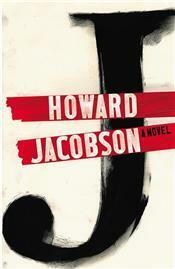 I haven’t read Howard Jacobson before but know he is known for his wit and satire and I can see why having read this. He has a great way with words and, with a point to obviously get across, he uses them well. At times, it did seem like too many ideas were being thrown at me, and I did have to stop to re-read sections because of this but it didn’t put me off. Similarly, the main characters aren’t particularly loveable. I’m not sure they are meant to be though because they are representatives of the best and worst of human nature and a reminder that, as good as we all want to be, sometimes – unfortunately – that’s just not good enough.